This fella looks like butter wouldn't melt in his mouth! Not sure if he was guarding my groceries as I unpacked. Or if he was waiting for his opportunity to chomp into the meat when my back was turned....! For the news of a new baby arrival across the seas. For photos of him when he finally arrives safe and sound, tiny and perfect. For Gareth to get home from school so we can go post a special parcel to him! I love our local library. I used it a lot when the kids were little and wanted constant new reading material. Then there was a lull where the kids grew a little and were busy with school work and trips to the library became relegated to school holidays. Since becoming a member of the Old Ducks book club I have started using it so much more. I often use their website to reserve books we plan on reading over future book-club meetings. Even with the amazing information to be found using Google there are still times where a library cannot be beaten. One of the girls recently had an assignment on Nordic religion and found it hard to find the material on-line. We called in to the library where they gathered every book on the Vikings from their shelves and ordered her in other books from outlying libraries at no cost. The day the exam was finished she handed me an armful of books to return. They weighed a ton! I really hope that in this day and age of e-books and on-line research that people still think to use their local libraries. Every so often there are rumours of budgets and closures but whenever I get a chance to give my local council feedback on which community services we value I make sure to say how valuable a service our library is. Do you use your local library? Or do you think their usefulness is being replaced by ever improving access to technology? I'm getting used to having this puppy around! A colleague in work was selling boxes of Cambodian Curry marketed by a company called Vissot which is overseen by a Columbian company called Jomin, a non-profit organisation which provides employment, education and a health centre to local people. The curry sachets were being sold today and tonight was our regular "Curry night" at home so I gave it a try. I really like the concept of helping people help themselves. It was a good curry, on the milder side for our families taste buds but one we will spice-up next time. Give a person a fish and you feed them for a day. Teach them how to fish and you feed them for a lifetime. Support their faith* and you feed them for eternity. A quiet wet afternoon. Kids in school, Byron in work, lots of time to sit and cuddle! ...you can buy your dog Crocodile bones at your local pet shop! I was completely incapable of cooking rice without burning it when I first met Byron. Over the last 20 years I have quickly realised that it is very easy to keep him madly in love with me. Have you heard the expression "The way to a man's heart is through his stomach" ? It was written about Byron. Most meals that are put in front of him are eaten with exclamations of appreciation. He really is very easily pleased. This week in particular I hit upon a magic combination. Spice, meat and beer. All it took was a pork leg rolled in brown sugar, mustard powder and paprika, a bottle of beer poured on top and 90 minutes in my trusty pressure cooker and he was in heaven. The pork was amazingly moist and tasty, served on crusty bread rolls and with a side salad of some random things in the fridge. Grated carrots and apples, cucumber, craisins and orange juice. Not only did he have seconds but thirds too. It's a good job we still do the 5:2 intermittent fasting or there would be twice as much of him to love!!! While toilet training Murphy we have been leaving the back door open just a sliver. Enough for him to nudge it open and run out onto the grass. The upside is less puddles on the tiles, the downside is Wilma learning that she too can nudge the door open and come in! She has been in and out, in and out like a ....... headless chicken? Don't put ideas in my head Wilma!!! Gareth was home sick yesterday with aches and pains and a general feeling of "miserableness"
I was doing fine until after dinner and then, bang, it hit me like a freight train. Sore throat, burning hot and shivery cold. I just wanted to sleep. I left Byron watch tv with the kids and I tried to curl up and read in my red chair but ended up wrapped in my rainbow blanket shivering and wondering if it was bed time. Some cheeky, not to be named, child decided to take a photo of me and said it should be my "photo of the day"
Today is the girls Athletics carnival. 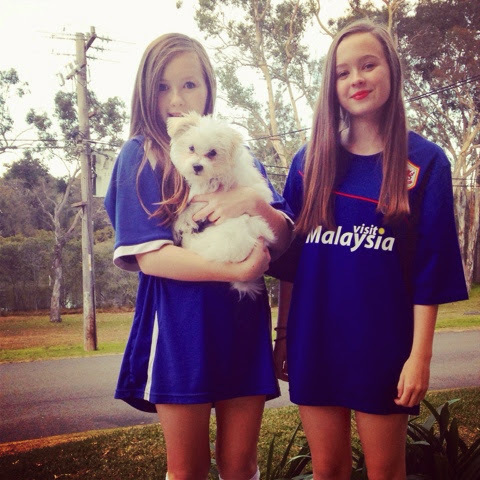 They had to wear their house colours (blue!) and also try to incorporate a sports team shirt to participate in "Rise for Alex"
Alex is a local sportsman who broke his neck 4 months ago while playing for his team, the Newcastle Knights. He is currently wheelchair bound and many local businesses and schools are fundraising for his ongoing medical bills and rehabilitation. St Paul's and St Joseph's along with many other local schools are encouraging their pupils to wear a sports shirt to school today to show support for Alex. Sushi has to be my favourite fast food ever! I'm boring and always go for the same choice, salmon and avocado with soy sauce and lots of wasabi! Yum! It's like having a new baby in the house. I have to keep a close eye on Murphy to make sure we don't have any toileting accidents. He pines if I leave his sight. Today there was no choice but to sit down with a cup of tea and a new library book and puppy-sit for a few hours! If I knew dogs were this much fun I'd have given in long ago! Here is a holiday snap I found as I was transferring images from my phone to the computer. It is of an Amethyst crystal that Rhiannon bought with her holiday money. She was drawn to two different stones in a small quirky shop and the lady offered to look up the qualities and characteristics of both stones. As soon as she started reading the qualities of this pendant Rhiannon grinned and knew it was for her. It was just meant to be! Whether the qualities are to be believed or not it is a really pretty pendant and I know it will bring her happiness at the very least! Along with Murphy has come a whole load of equipment and products. I wanted a system of storage that wouldn't take up too much room in an already small laundry room. I found some shower caddy's in The Reject Shop and drilled them into the laundry room wall and now the kids can see at a glance where to find what they need to help care for him. It's fun here watching our new addition get to know our Chicken! The more that I feel stressed the more I turn to food as my salve. Not just the eating of it but the preparation. The colours of the ingredients gathered together. The before and after as nourishing veggies and meat are transformed into a simmering pot of goodness, with a little help from the addition of a can of Guinness! I still feel odd about walking into the local bottle shop on an early midweek morning and walking to the counter with one can of Guinness in my hand. I usually try to crowbar in some conversation about the Beef and Guinness casserole that is being made in my kitchen that day. The smile as I am passed my brown paper bag and change. "That's what they all say" says the glint in their eyes as I hurry home to start my beef marinating! Today we welcomed a new member into our family. While I worked this weekend Byron and Rhiannon "accidentally" fell in love with a puppy and did everything but the final paperwork to make him ours. They left all the practical stuff to Mum (as you do) like clearing out an area of the house for him and working out the practicalities (details, details they laughed!) And so today in a flurry of chaos we found ourselves the proud owners of a 12 week old male puppy who we have named "Murphy"
A gorgeous plump juicy lemon. But which shall we choose?! Yesterday Rhiannon and myself stayed up till midnight sewing. She was making a dress very similar to one worn by the character Daenerys in Game of Thrones. We had the alarms set for 6am this morning and were up and out the door to catch the 7am train to Sydney. There was a Game of Thrones exhibition on in the Museum of Contemporary Art. It was only on for three days and today was the final day. We had read reports of long queues at least 4 -5 hours long and we had a backpack of snacks to keep us going for as long as it took. 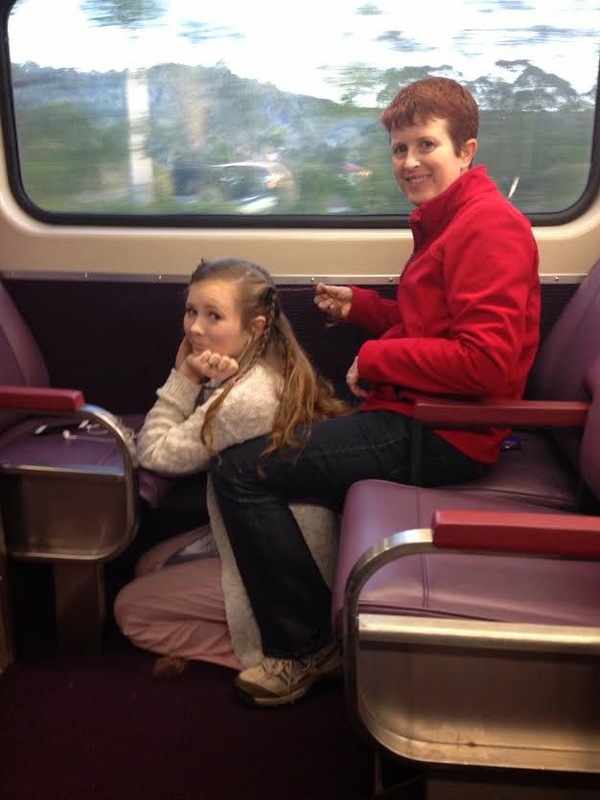 On the train to Sydney I had time to plait Rhiannon's hair into a style she had found on-line. When we arrived the queues were unbelievable. They snaked around the security barriers well past the "4 hours from here" sign. We stood in line and then were approached by girls who were much further ahead than us. They saw Rhiannon dressed up and were giving up on waiting and wanted to offer their space in the queue to us because of the effort they could see Rhiannon went to. We chatted to the people around us in our new queue position and found out that they had been queuing since before 8am knowing the exhibition opened at 10am. Over the coming hours we chatted and nibbled on snacks and watched excitedly as more and more people joined the queue. The exhibition was open till 8pm and we wondered how much of the day it would take before we would be able to get in? Imagine our disappointment when, close to midday, the line was officially closed about 100 people ahead of us. The staff had worked out the numbers in the queue and knew that the maximum amount of people were in line to get through before closing time. There were some very upset people especially as a few people in the official queue had skipped ahead to get their place. We talked about waiting outside in the hope that the queue may be re-opened as the first few thousand people got through. When the staff called the police to help with crowd control we knew we would have to give up. It just wasn't worth it. It was a quiet train ride home. The mornings excitement had been replaced by frazzled nerves and the tiredness of the late night and early start were beginning to show. We thought through all the "what if's"
What if we had got up an hour earlier? What if we had slept overnight like the people at the front of the queue were rumoured to have done? In the end we tried to make the best of the half-adventure that we had experienced. The next morning we read the news reports saying the people who were at the end of the official queue had queued for over 10 hours and then got turned away because the museum had closed their doors. We were glad then that we had walked away when we did. Not quite the day we were hoping for but at least we tried. Lying flat on my back on soft white sand the Rehab corridor. Not a cloud in the sky on the ceiling. Just the sound of waves crashing on the nearby rocks patients bells ringing in the nearby rooms. Sharing the beach ward with my four favourite people in the world 22 patients. 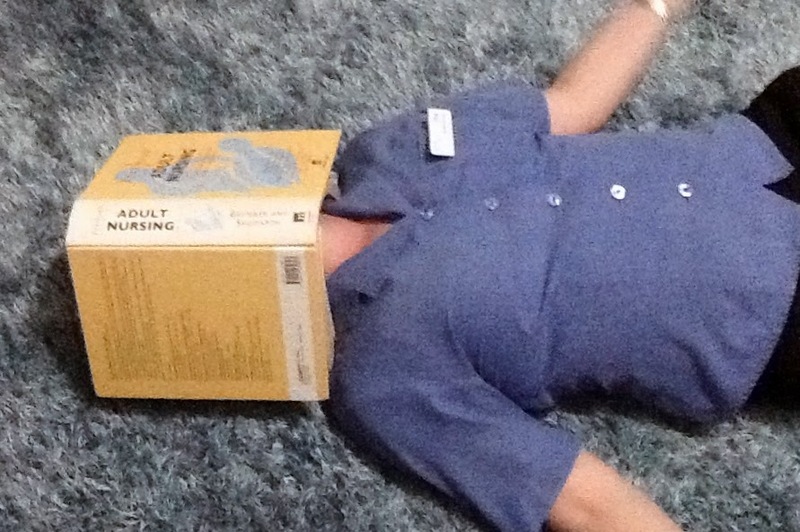 Holding my book nursing notes high above my head to shade my eyes. Reading about love letters written in the depths of Scottish winter raised temperatures and I.V. antibiotics while the Australian sun UV lights warm my arms. D: Just because it *&%#@%^&* isn't OK? Lying flat on my back on soft white sand. Not a cloud in the sky. Just the sound of waves crashing on the nearby rocks. Sharing the beach with my four favourite people in the world. Holding my book high above my head to shade my eyes. Reading about love letters written in the depths of Scottish winter while the Australian sun warm my arms. Gareth has regularly heard me talking about what image will be my "Photo of the day" For six months now I have managed to blog each and every day. 183 days. 183 photos. Today he told me he had a great idea for a photo. He wanted to fill his frisbee with fine dry sand and throw it in the air while I took a photo. When we did it this afternoon we ended up with three images. He couldn't decide which one was the best so I made a collage. Today was a lazy day. It started with sticking a tray of ham + cheese croissants in the oven while we got dressed. We packed them in a bag along with our towels and walked to the local beach. Breakfast was eaten on a picnic bench next to the sea. It was idyllic. For a day that started out at 1°C it warmed up to a respectable 17°C by mid afternoon. As a teenager I bought myself a Winsor & Newton travel watercolour set. It holds a dozen small pans of colour and is small enough to fit in my pocket. Twenty something years later and Rhiannon was starting to "borrow" it so I bought her her very own version for her birthday in April. Today we brought the two sets and some paper with us and spent a couple of hours sketching and painting the sea, some random plants and stones that caught our eye. This is the beauty of holidays. A chance to do the things we never seem to do in our normal day to day life. No chores, no work, just time for fun!